If you’re one of those professionals who travels regularly, the notebook is probably your favourite work tool. OXFORD has created its international range especially for you, designed to simplify your day-to-day organisation. The range is now being expanded with a new “tablet” format. Thanks to this, your notebook will accompany you even more easily in all your activities. And, for an enhanced experience, all the notebooks available in tablet format are compatible with the SCRIBZEE® application. Make them the best allies of your mobility and efficiency! As electronic devices (tablets, mini-computers, etc.) get smaller and smaller so do our computer bags and briefcases. In keeping with this trend, OXFORD is launching the B5. Intermediate in size (18 cm x 25 cm) – between A4 and A5 – this “tablet” format offers you a sufficiently ample surface for comfortable note-taking. It is light and it also fits very discreetly into a bag. Moreover, thanks to the markers printed on each page and via the SCRIBZEE® application, you can scan, file and share your notes, wherever you are! And what will your new mobility tool be? Notebook: Europe’s best-selling business notebook with its hard cover and 360° opening for easy use in a small space (plane, train, etc.). Activebook: incorporating a storage pocket for your important documents, as well as a removable divider for quick access to your next clean page. 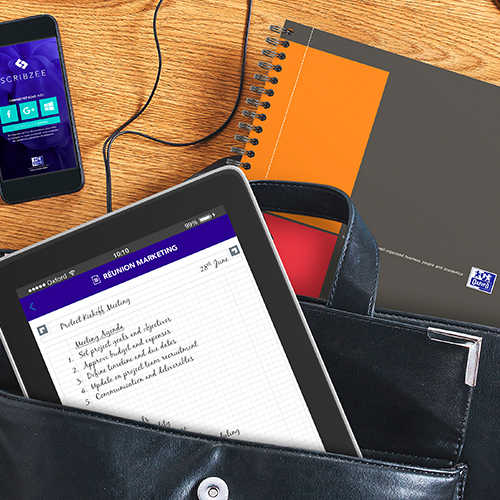 Meetingbook: your mobile office with its elasticated pocket, enabling you to safely carry your documents, calculator, pen or USB stick. All you have to do is choose the one most suited to your needs or, why not, try all three! Previous Post:Organise your handwritten notes with a single click with SCRIBZEE! Next Post:Business meetings: save time and work more efficiently with SCRIBZEE!